Refrigerators and freezers were for a long time the most energy-consuming home appliances in a household, but manufacturers have begun producing more energy efficient models over the last 5-10 years that use significantly less power and thus produce fewer carbon emissions. Improvements have been made to the design, motors, air compressors, door seals and insulation of these newer models so it is highly recommended by our technicians that homeowners purchase an energy-efficient refrigeration unit. After a home’s refrigerator and freezer, a clothes dryer the most energy of any appliance. According to the Environmental Protection Agency (EPA), 75% of the dryers used by homeowners in the U.S. are electric, which can consume about as much energy as an energy-efficient refrigerator, dish washer, and washing machine combined. The best way to reduce your carbon footprint while saving money on your energy bill is to utilize line drying outdoors. While they might not consume as much energy as a refrigerator or a dryer, light bulbs still significantly contribute to a homeowner’s carbon footprint. That is because literally every home uses light bulbs, lights are used for more hours than other household appliances, and multiple lights are usually kept on simultaneously. 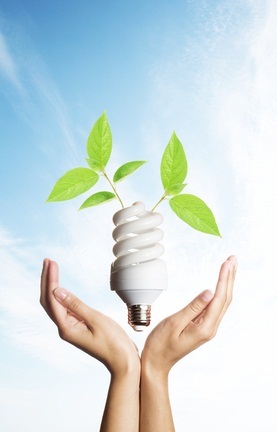 Reduce your carbon footprint by switching to energy-efficient bulbs. If you have an older model refrigerator, washing machine, or dishwasher in your home, 911 Restoration highly recommends looking into newer models. Not only will you improve energy efficiency, but you’ll also greatly reduce the possibility of water damage from a hose burst.